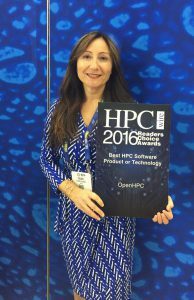 OpenHPC Boardmember Figen Ulgen Receives the HPCwire Reader’s Choice Award on Behalf of OpenHPC at SC’16. The Readers’ Choice winners are determined through election by HPCwire readers. The process started with an open nomination process, with voting taking place throughout the month of September. These awards are widely recognized as being among the most prestigious recognition given by the HPC community to its own each year. Read about the all of the winners here. LANL and Seagate’s Cooperative Research and Development Agreement (CRADA) develops power-managed disk and software solutions for deep data archiving and other next gen technologies. OpenPOWER Academic Discussion Group is a community within the OpenPOWER Foundation focused on collaboration between industry and academia to develop a broad ecosystem for the POWER architecture.The Texas Advanced Computing Center (TACC) Lonestar 5 supercomputer, now in full production and built off technologies from Cray, Intel & DataDirect Networks, anchors TACC’s collaboration with industry program. SDSC, TACC, Open Science Grid, XSEDE & UNL’s Holland Computing Center collaborate to verify the groundbreaking LIGO gravitational wave discovery.